A small man and a giant builder. But the small man is honest while the big builder is cunning. The plot has ingrained bollywood heroism. The defiant builder story started in 2009. 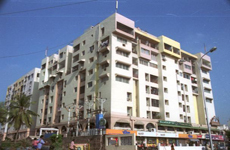 The mighty builder is Nirmal Life Style in Mumbai which boasts of being a premium real estate brand in Mumbai. The group has been creating waves for entering into alliances with international brands for its residential and commercial projects. A long story started 5 years ago when one Amit Valecha at Shahd (A town in Thane district in Maharashtra located 60 km from Mumbai) had reportedly agreed with the developer to purchase the ninth floor apartment in 2009, booked the flat and paid 20% of the agreed purchase price by September 2009. Valecha wanted a housing loan and needed the documents, including the agreement copy. Valecha’s woe was that on every occasion he asked for the documents, the builder expressed an inability to give them on the grounds that the commencement certificate for the floor was yet to be obtained. After several efforts, Valecha managed to get a home loan in the absence of the documents. He alleged despite this, the builder through his representative demanded an enhanced price for the flat. When he refused to pay it, the booking was cancelled. Valecha was not the type of taking it lying low like several flat buyers. He filed the complaint last year. As usual the builder reportedly denied the allegations and said contrary to the agreement, Valecha refused to pay installments as per the construction progress. It further claimed the flat buyer had gone ahead and sought a loan from another bank, despite being advised to secure the loan from the bank with which the builder had a tie-up. The forum directed the builder to hand over the flat purchased by complainant Amit Valecha at Shahad, by taking the remaining amount of the agreed flat price of Rs 13.88 lakh and a compensation of Rs 1.20 lakh. Can a joint-holder be office-bearer?